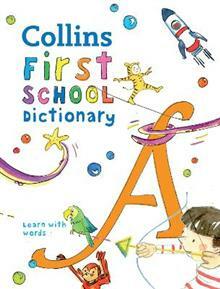 An ideal introduction to the world of words and dictionaries for children aged 5 and above. The simple, full sentence definitions reflect the child's experience of the world, and the colourful illustrations help make learning easy, memorable, and fun. This book offers help to children in learning the alphabet, English spelling, and the basic meanings of everyday words. With the alphabet at the edge of every page, and each letter a different colour, it is easy for children to learn how to recognise different letters, look up words and find out how to spell them. The illustrations make the dictionary fun and appealing, allowing children to understand what words mean, while example sentences show how the words can be used. The simple grammatical labels provided introduce children to different word groups. Simple, fun and easy-to-use, this is the perfect for any child's first school dictionary.